We cater to any style event. Bring a vintage theme to any event with an acoustic trio. Music ranging from americana to soul. String band perfect for weddings and special gatherings. Acoustic group of Hawai'i based musicians specializing in string instruments. Guitar, Mandolin, Upright-Bass, Banjo and vocals round out this versatile collective. Ranging from original music, that lends to the style of americana, folk, bluegrass, island grooves with a unique blend of modern hooks to performing audience favorites that cater to the style of event. Hook+Line can bring energy forward performances ideal for bar, nightlife, party, festival scenes while being able to switch to mellowing the mood for events such as weddings, wine dinners/tasting, corporate dinners, beach/family gatherings and private events. So raise the bar at your next event and bring a live music element. I had the pleasure of booking Hook+Line for two occasions; one a street fair in Chinatown Honolulu, and again for a new restaurant in a Honolulu hotel. Jake and Mari were great! I love their unique sound, and I found myself singing the line of one of their original tunes several days later. "Gimme that hey, gimme that ho! Gimme that yeah, gimme that no!" They also were very easy to work with. I look forward to booking Hook+Line again soon! 50th Birthday party music was a HIT! My art show was a hit, thanks Hook+Line. So glad I decided to get live music for my gallery opening. They kept the energy going and my guests loved it ! Highly recommend . Perfect atmospheric music for my small wedding! This group was a true pleasure. They took requests and blended in perfectly to our special day:) My guests enjoyed the music , and really made a difference in them having fun ,,highly recommend Hook+Line! Your guests were so much fun! Thanks for having us. Live music entertainment that blends perfecttly to the style of your event. We'll cater to the style of your event ranging from soul, blues, americana, folk, bluegrass, and jazz all with a modern lines and hooks. Hook+Line consists of musicians who've worked with Hawai'i favorites such as Taimane, Saloon Pilots, and The Infamous Bourbon Boys. 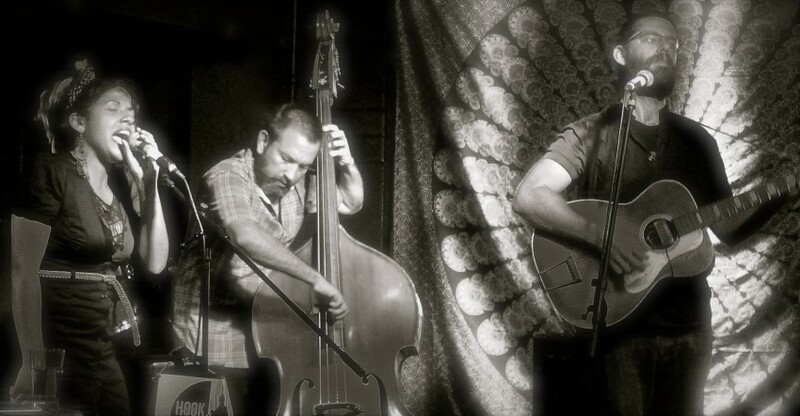 A four-piece acoustic collective featuring Guitar, Mandolin, Upright Bass, and Banjo as the base instruments. Multiple members carry Bachelor Degrees in Music and with over decades of music performance experience. Hook+Line will sometimes explore other instruments such Cello, Blues Harp, and Fiddle along with featuring guest musicians. Vocals which are mainly done by their female member will also be shared by the whole group at times. With the knowledge of an extensive list of audience favorites Hook+Line can cater to the style of any event. Perfect for weddings, from background music while guest are arriving to your wedding, the ceremony music, and lastly to the live music entertainment for the reception, Hook+Line can do it all! Beach gatherings and corporate events will be remembered by your guests when featuring high quality live music. No fuss live music entertainment. We provide all our own equipment and sound set-up. For events that are larger and require louder sound , we do request that you have your own PA system. If not available Hook+line will provide one for an extra fee.